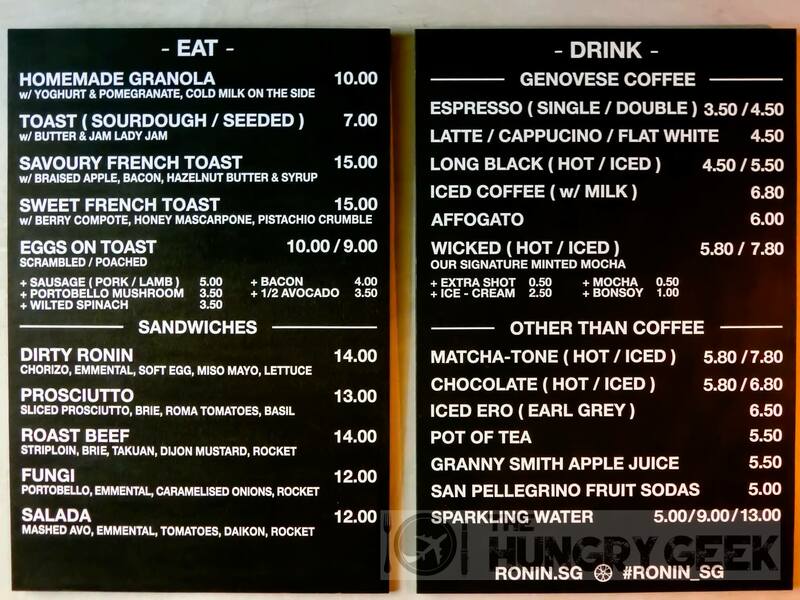 Ronin Cafe came up on our radar when we were searching for the best scrambled eggs to try in Singapore. In line with their rōnin theme, they are located in this obscure hole in the wall along Hongkong St, with no visible signage. A rōnin was a samurai with no lord or master during ancient Japan – contemporarily, a rōnin refers to a vagrant or wandering man. Ronin Cafe has adopted this cool stealthy samurai concept, with obscurity from the lack of signage, and a cool dark theme within the cafe. This place is not meant to be easy to find, with no Facebook page and only a one-page website. 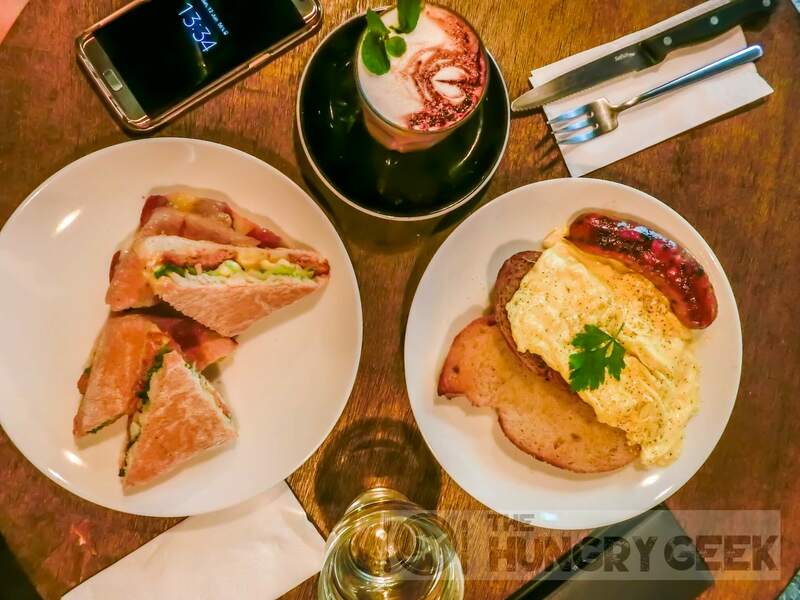 The owner of Ronin Cafe brought the food concept from Sydney, Australia – including their signature scrambled eggs and French toast. Apart from the large menus on the wall near the entrance, you won’t get any normal sized menus here to make your food selection. 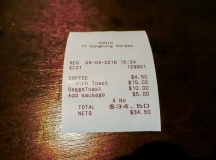 Also, they do not make records of the food you order – it is run on a trust system and you have to inform the cashier of the items that you ordered when making payment. 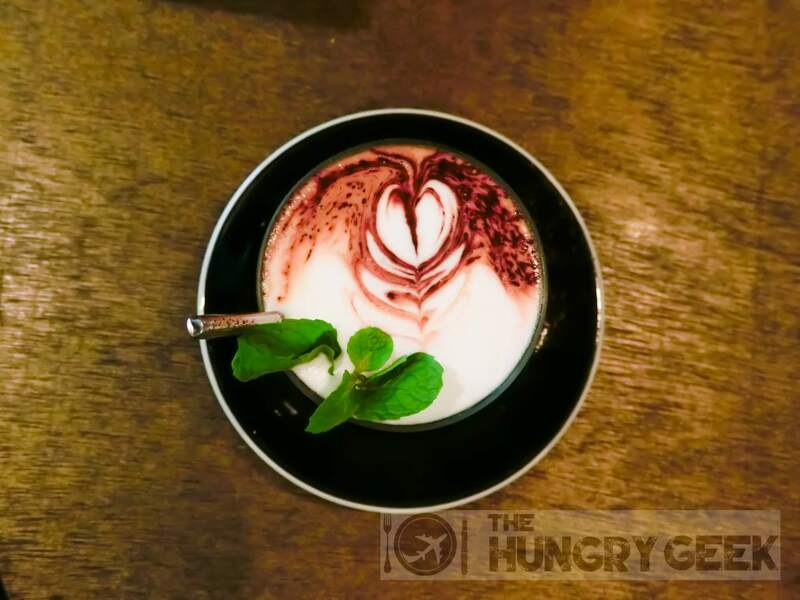 The owner’s idea was to get people to talk more to each other, and we must say that as a result of these tweaks the staff here are much more friendly and outgoing. There is no monotonous order-taking or bill payment – every customer’s experience will be different. 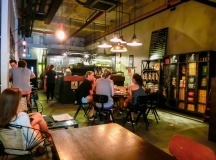 The atmosphere here is definitely very different from the typical Singapore cafe. Our regular readers would know that we are big scrambled eggs fans. The best scrambled eggs that we had ever eaten were from Australia Dairy Company in Hong Kong. 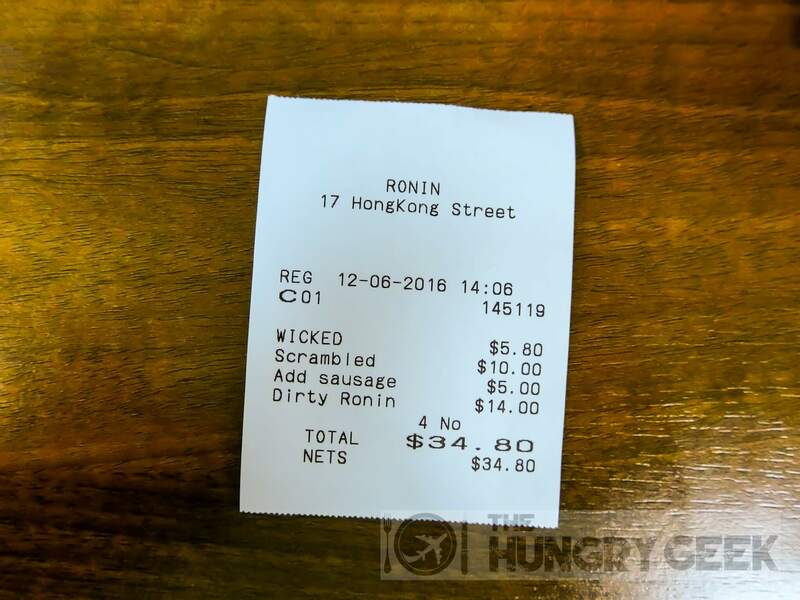 How does Ronin Cafe’s signature scrambled eggs measure up? For the uninitiated, there are many different ways to make scrambled eggs. 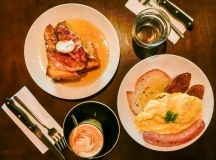 For instance, there is the British style scrambled eggs that are light and fluffy, the French style ones that are cooked over a water bath, and the American style ones that are cooked in a pan. The texture of the scrambled eggs at Ronin Cafe is close to the American style ones, not too fluffy or sheety. The incredible part about the scrambled eggs at Ronin Cafe is the seasoning and the taste. On your first bite there is this super shiok feeling where the fragrance from the eggs simply explodes in your mouth. They know how to make their scrambled eggs very well. Personally I’m more of a fan of the fluffy French or British style scrambled eggs, but nonetheless we have to give this super delicious dish 4.3/5. Celebrity Chef Jamie Oliver says that all the types of scrambled eggs need the same amount of seasoning and ingredients – if the guys at Ronin Cafe could try making their scrambled eggs more fluffy and soft while preserving the recipe, we think that our ratings records could be broken. We tried both the pork and lamb sausage options on different days, and it is really a matter of personal preference. If you want something different, try the lamb sausage. 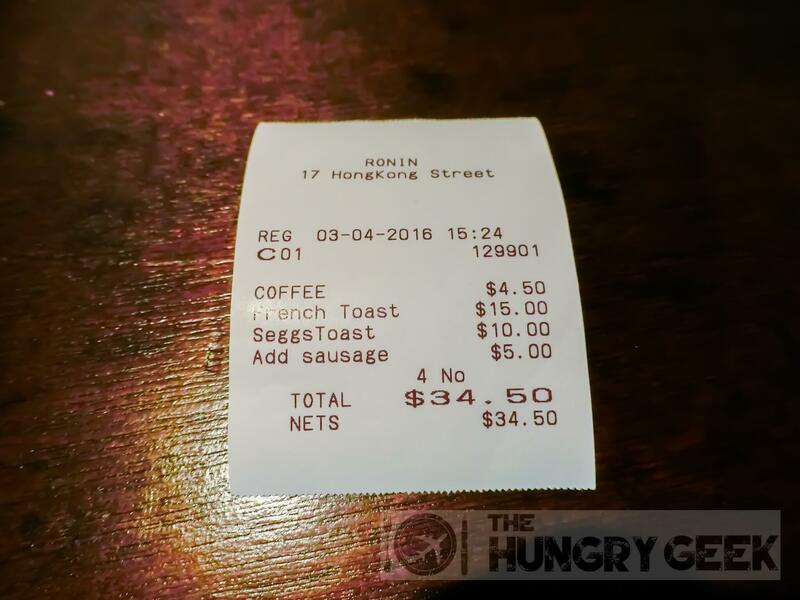 The main Eggs on Toast dish costs S$10, and the sausage option an additional S$5. 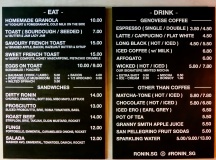 So Ronin Cafe closes at 6pm on weekdays and 730pm on weekends. Do take note that they stop taking orders for scrambled eggs 45 minutes before closing. You will have to order a sandwich if you come too close to their closing time. We suggest arriving at least 1-hour before they close. There was once when we arrived at 646pm on a weekend, and there was no more scrambled eggs for us. This is a really unique creation by Singaporean standards – french toast with braised apple, bacon, hazelnut butter and syrup. This is really a sweet delight. The bacon goes exceptionally well with the french toast, hazelnut butter and syrup. On our first visit, Sheryn remarked that the braised apple seemed a bit out of place, and perhaps the dish could be improved with a removal or replacement of that ingredient. After our visit, we did some searching and found this sentiment shared by other food critics as well. However, it seems that the owner was not too willing to consider any tweaks here. We give this 4/5, and it is priced at S$15. If you do come too late, you can get their Dirty Ronin sandwich. It is pretty good! It comes with chorizo (a type of pork sausage), emmental (a type of Swiss cheese), soft egg, miso mayo and lettuce. This is another deliciously unique dish – just imagine a cheesy sausage sandwich. We rate this 4.1/5 and it goes for S$14. We think this sandwich could have been better if the cheese was melted more or there was more miso mayo, or even pineapple. 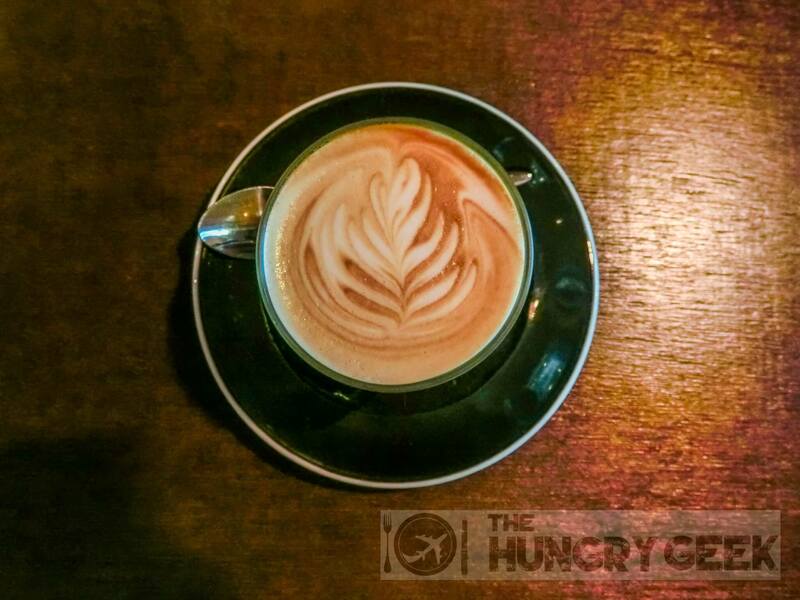 The first drink is their Latte, and the second one is their hot Wicked drink, which is their signature minted mocha. Both are priced at S$4.50. I am not a coffee fan but Sheryn is. For their Wicked, she says that it is quite minty and the coffee fragrance is not too strong. She says that on hindsight, she would have ordered the cold version. Definitely one of the best scrambled eggs in Singapore. A few small tweaks and their already delicious food items could be pushed to another level. The ambience is great and the service is top-notch. 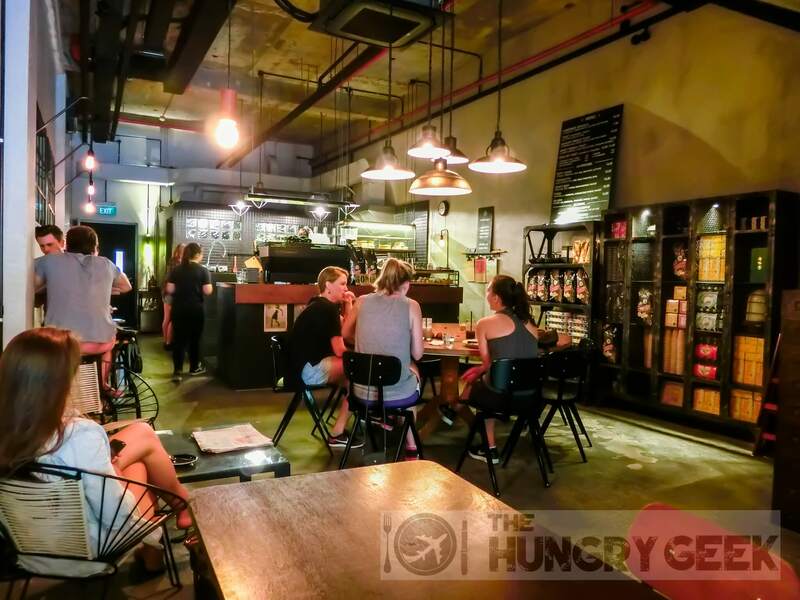 This is definitely a great place to hangout on weekends – if only they opened until late. Also, don’t come too close to their closing time if you want to get their scrambled eggs.